Latest news: This broadcast will also be live on Facebook here. The film Tashi’s Turbine will have it’s broadcast in the United States on PBS on November 13th 10pm EST. Set in the grasslands of the Himalayan Mountains, Tashi’s Turbine is an uplifting tale of a small village’s attempt to harness renewable, sustainable energy — the power of the wind. Friends Tashi and Jeevan journey from Kathmandu to Namdok with hopes of building a stronger Nepal, one wind turbine at a time. Their first site is a remote village that previously relied exclusively on flickering candlelight. 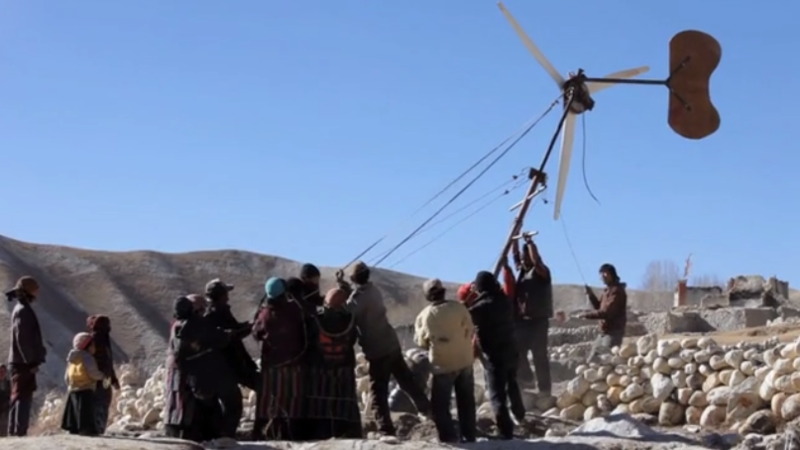 As Tashi and Jeevan work with the villagers, the elements and landscape bring unforeseen difficulties for installing a turbine — increasing the struggle to realize the community’s vision of power created by windy nights.